Driven by a shared passion for a more sustainable world, Earthsave Whistler and local restaurant Alta Bistro are bringing Meatless Mondays to Whistler, to further highlight the impact of our food choices on the environment and provide a rewarding way to lighten our footprints. Meatless Mondays are fast becoming popular in the US, with 50% national awareness and an estimated 18% of the population taking part. Some restaurants in Vancouver also support Meatless Monday, or in the case of Provence Restaurants in Vancouver, Meatless Mardi. But the movement has yet to catch on in Whistler, despite a strong commitment to the environment in the community. The United Nations brought the environmental impacts of livestock production into the spotlight in 2006, with their Livestock’s Long Shadow report, which concluded that livestock production has a greater impact on the environment than the entire transport sector. Numerous research reports have followed and it has even been found that going vegetarian one day a week has a greater positive impact on the environment than buying ALL of your food locally. There is a false misconception that food without animal products is bland or boring. 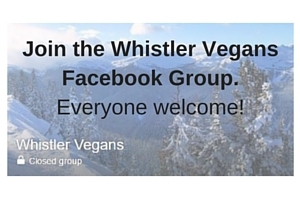 Many Whistler restaurants already offer delectable plant-based dishes and prove that this is not the case. Alta Bistro aim to add their culinary excellence into the mix and present meatless specials on Mondays that delight the taste buds and satisfy even the most committed carnivore. Launching Alta Bistro’s Meatless Mondays is a special dine-out event, organised by Earthsave Whistler. Alta Bistro will be offering a 3 course 100% plant-based dinner for $29. More info and RSVP. Come join us and lighten your footprint, improve your health and discover new culinary delights!